SOS Grantham Hospital Nominates Jayne Dawson of Ancaster for the Ancaster Co-op’s ‘Doorstep Challenge Award’ for service to the community. And we are very pleased to announce that Jayne did in fact receive the award and you can read the story on the Grantham Journal website. Jayne is a stalwart member of SOSGH, our campaign group formed back in 2006 to save our Grantham hospital. Which in August 2016 started an online petition and a paper petition to gather signatures in protest at the decision by United Lincoln Hospitals Trust (ULHT) to close Grantham Hospital Accident &Emergency department over night between the hours of 6:30pm – 09:00am. This decision has angered residents of the town and outlying district, and the petition has accrued over 40,000 signatures to date and is due to be presented to Jeremy Hunt, the Secretary of State for Health, in London very shortly. 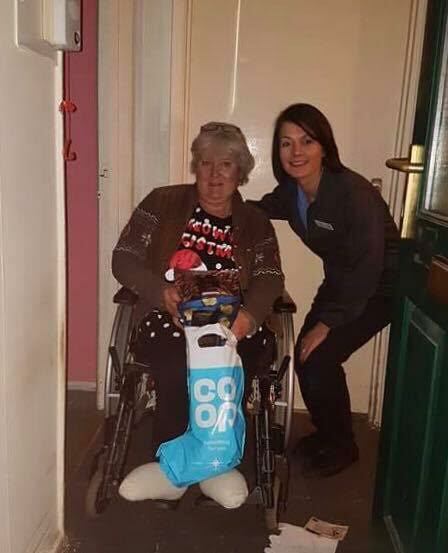 Jayne, who lives in Ancaster and is wheelchair bound, has personally collected over 13,000 of these signatures from visitors to the Co-op and Woodland Waters in Ancaster, and shoppers in the Isaac Newton and George Shopping Centres in Grantham. Very recently an anonymous donor, a gentleman living in Ancaster, bequeathed Jayne a motorised scooter to help her with mobility! SOSGH would like to thank this man for his kindness and generosity, and Jayne for her unwavering devotion to the cause! Charmaine Morgan puts Jayne top of the list of invited members to join the SOS Grantham Hospital delegation when they travel to Parliament to hand in the petition. If you see Jayne about be sure to sign the petition or you can sign the SOS Grantham Hospital online petition.